In 2019, app App Store consumer spend will surpass $120bn, double the size of the global box office market, according to new research. 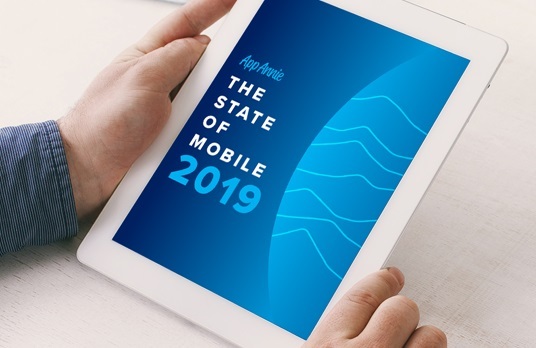 App Annie's State of Mobile 2019 report, covers the impact of mobile across gaming, retail, banking, social networking, travel, worldwide business and Gen Z behaviour. From the impact on IPO valuations to the way we shop and bank, this report provides a glimpse into the transformation of our daily habits thanks to mobile’s prolific influence. App Annie also reveals the top apps and companies by consumer spend, usage and downloads, worldwide and buy county. •	App store consumer spending in the top 5 video streaming apps worldwide grew 285% in 2018 versus 2016. •	Globally, over $2.2B was spent on the top 5 video streaming services in 2018. •	10 minutes of every hour spent consuming media in 2019 will be streaming video on mobile. •	Half of time spent on mobile globally was in Social and Communication category apps in 2018. •	On the iOS App Store, 65% of downloads come from organic search. •	The top 5 car sharing apps grew 25% year over year in 2018. •	Bike and scooter sharing apps had their breakout in 2018 with a 500% growth in user base. •	Airlines grew their global footprint by 50% in 2018 from 2016 - the top 5 Airlines apps grew their average monthly usage 50% from 2016 to 2018. •	In Q3 2018 alone, there were 2.7 million dating app downloads in the UK. •	2018, Q1-Q3, Tinder generated more consumer spend than Netflix, in the UK, across Google Play and the iOS App Store combined. •	Global consumer spend in Health and Fitness apps have grown 3x in 2018 from 2016. •	Downloads of Medical apps have grown in 2018 in both mature markets like the US, UK and France at over 35% as well as emerging markets like Brazil, India and Indonesia at 35%, 65% and 110% growth respectively. •	Gen Z (aged 16-24) engages 30% more on average with their most used non-gaming apps than those aged 25 and older. •	Specifically, Gen Z spends 20% more time and engages with their most-used apps 30% more often than the rest of the population. •	Mobile is second nature and used across nearly all aspects of life — communication, socializing, shopping, banking, etc. •	Mobile is non-negotiable to any business hoping to attract this demographic.